Google, Apple and Microsoft all want kids to think they're cool -- so they're taking the battle for future technology consumers into the classroom. 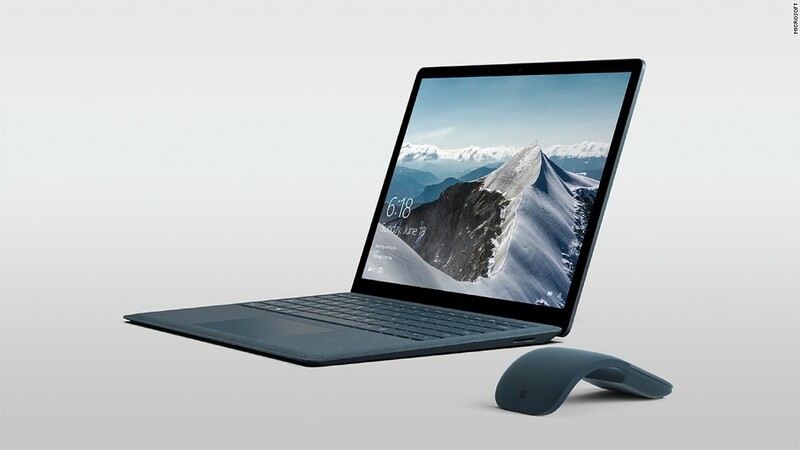 On Tuesday, Microsoft (MSFT) announced a new lower-priced Surface laptop and a special version of Windows 10 just for students. It's a major push to reclaim some of the U.S. education market that has been eaten up by Google over the past three years. Google's success has pushed Apple and Microsoft to to focus on affordable hardware -- combined with simplified management options to appeal to schools. Google's (GOOG) Chromebooks have been an unexpected hit with schools. They're inexpensive laptops running the Chrome operating system churned out by various manufacturers, and they can cost as little as $199. In 2016, 12.6 million mobile PCs and tablets were shipped to grade schools in the U.S. -- and Google's Chromebooks made up 58% of those sales, according to Futuresource Consulting. And cheap hardware is only part of Chromebooks' allure. Schools gravitate toward Chromebooks because they make the Herculean task of managing an entire student body's IT easier. "Google was so successful because they offered a simple means of managing and distributing technology," said Christopher Voce, an analyst with Forrester. "A teacher could easily administer and control the apps that were on a Chromebook without much effort." Microsoft's new Windows 10 S revealed on Tuesday aims to help teachers too. The operating system limits which apps students can download and locks their settings. Apps can be downloaded only from the Windows Store, in a "walled garden" approach that Apple perfected on iPhones and iPads. Apple (AAPL) itself created an app called Classroom for managing multiple devices. The companies are playing a long game. Education is where many trends take root, like cloud email platforms. Google's style of simplified management could trickle up to large companies, saving them money with each massive app upgrade. School is also where kids decide what they like. "Certainly there are dollars they're competing for, but more so they're indoctrinating students into a way of engaging with tech," Voce said. Many kids get their first taste of PCs in schools, especially now that so many use only cell phones outside the classroom. For example, even when Apple was struggling for mainstream appeal, the company had a strong presence in schools. That early exposure could have contributed to the current generation's fondness for all things Apple. Unfortunately for the company, the success of Chromebooks has also cut into Apple's education revenue. Like Microsoft, it's trying to fight back. In March, Apple announced a new iPad that seemed pretty conventional. It didn't add any flashy new features and wasn't significantly more powerful than previous versions. But that didn't matter: It had a lower price tag, starting at $329, and was made for schools.